(other locations upon estimate request). Brand: SSL - Solid State Logic. Model: XLogic Alpha Channel with. 01 Channel Strip rack with. Combination of a MicPreamp, Filter, EQ and Dynamics. Why our price is so low and a real opportunity? We kept some inventory that we are now clearing it up. It's time to show your DAW who's boss. SSL analogue channel processing for your audio workstation. Pro mic preamp with line and instrument level switching. Studio class EQ, Filter and Limiter sections. Variable Harmonic Drive circuit - a time machine of distortion characteristics. Analogue or digital outputs direct to your DAW. All great sounding recordings have to start somewhere.. With the classic combination of a mic preamp, filter, EQ and dynamics, the XLogic Alpha Channel brings SSLs sonic legacy bang up to date in an analogue channel strip designed to provide the perfect front end to your digital audio workstation. With all the features needed to record great vocal or instrument tracks, the Alpha Channel offers a studio class mic pre and processing based on SSLs years of experience in designing the worlds leading analogue recording consoles. A huge proportion of the music you know and love was recorded on SSL, renowned for the superior audio qualities youve heard on countless hit records. That elusive sonic ingredient is here in the Alpha Channel. Professional ultra clean mic preamp with line level & Hi Z instrument input switches. Variable Harmonic Drive circuit; a Time Machine of distortion characteristics. High Pass Filter with selectable 40Hz, 80Hz or 120Hz cutoff frequency. Built in professional quality Analogue to Digital conversion - as standard. Auto sample rate sensing and self adjustment. 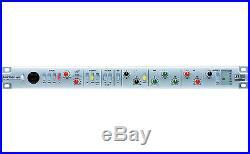 Three band SSL parametric EQ with mid freq Q control and dual LF curves. Intelligent auto compression that maximises recording headroom and avoids DAC clipping. 230mm / 9 casing only. 44.5mm / 1.75 (1 RU). 438mm / 17.25 casing only. 482mm / 19 inc rack ears. 3.0kg / 7 pounds. 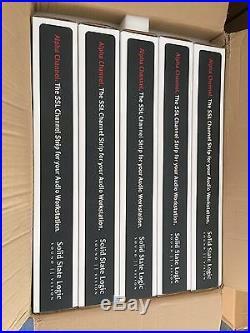 320mm x 550mm x 80mm. 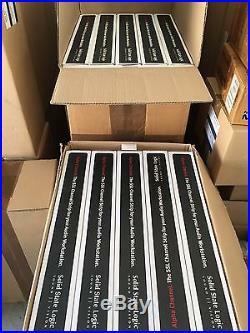 12.75" x 21.75" x 3.25. 3.5kg / 8 pounds. IEC320 3-pin connector, 100 240 Vac, 50 60 Hz. Balanced, 3-pin XLR-F, Zin = 1k (10k for Hi Z). Un-balanced, ¼ Mono Jack, Zin = 1M. Balanced, ¼ Stereo Jack, Zo = 40. Balanced, ¼ Stereo Jack, Zin = 10k. RCA phono, limiter sidechain control voltage dc. RCA phono, 1V pk-pk, Zin = 75, SPDIF format. The ADC will lock to this signal if present. RCA phono, 1V pk-pk, Zo = 75, SPDIF 24bit format. Synchronised to SPDIF In, else free-runs at 44.1kHz. 20dB min, 76 dB max. 26dB min, 82 dB max. 70 dB from 50Hz to 10KHz. +/- 0.2 dB from 10Hz to 70KHz. Mic Amp Distortion - A Typical Specification. 0.7 - 1.9. 1.5KHz - 22 KHz. 12 dB min, 14 dB typ. 24 dBU, unity gain to output. 12 dBU, +12 dB gain to output. 24 bit, 192 KHz CS5361 ADC. Locks to user supplied SPDIF IN. Range: 32 KHz to 108 KHz. Defaults to 44.100 KHz. 200 mV p-p IN min. ADC Performance Measured From Insert Return. Dynamic Range, 20KHz measurement bandwidth. ADC Distortion, 1KHz test tone. Distortion in 20K meas bw. +/- 0.1 dB, 20Hz - 20KHz. +/- 0.1 dB, 20Hz - 40KHz. 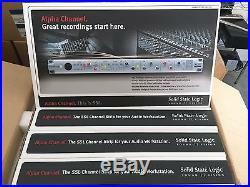 The item "Solid State Logic SSL XLogic Alpha Channel MicPre EQ Filter Dynamics SUPER PRICE" is in sale since Friday, October 28, 2016. This item is in the category "Musical Instruments & Gear\Pro Audio Equipment\Preamps & Channel Strips". 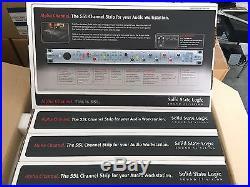 The seller is "justproaudio" and is located in Windermere, Florida. This item can be shipped to United States, to Canada, to United Kingdom, to China, to Mexico, to Germany, to Japan, to France, to Australia.